Matrix unveils COSEC with new communication architecture to connect geographically distributed sites in a simple way. Irrespective of distance, user can connect up to 1,000 sites and 10,000 DOORs without any public IP to manage Attendance and Access from a central place. The Intelligent COSEC DOORs and PANELs automatically find the COSEC server and starts communicating immediately. This new architecture compatibility is incorporated in all the COSEC DOORs and PANELs. Fig. shows COSEC deployment at multiple sites with multiple door controllers in a large enterprise having corporate office, manufacturing unit and branch offices located at different geographical locations. COSEC application server is installed at corporate office (CO) to manage attendance of all employees centrally. 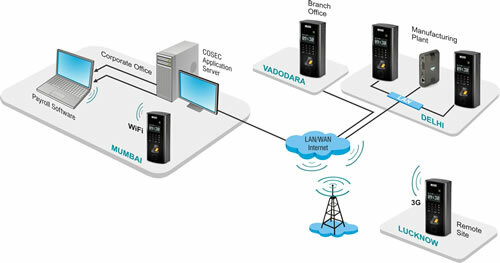 COSEC door controllers or panels at each location automatically find COSEC server using available connectivity (GSM, WiFi or WAN). It records user attendance from fingerprint or card and send it to the COSEC application server in real time. COSEC server processes the user attendance data and sends it to the payroll software or generates reports.